Until Gingerbread falls below 50% on the Android distribution charts, I’m going to continue to use the same post title for these stories over and over again. When did we get Android 2.3? Two years ago? 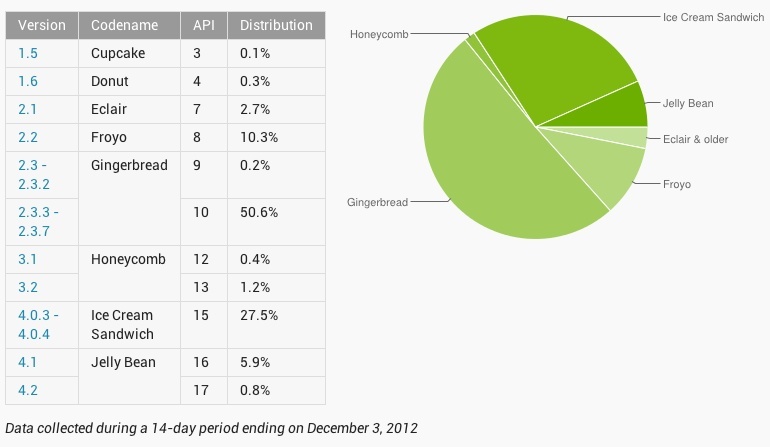 Yep, two years ago, and it’s still dominating the Android platform. While Ice Cream Sandwich has slowly climbed to 27.5% after a year, and Jelly Bean to 6.7% after 6 months, it’s still a mobile OS that will be prone to criticism over its fractured update system. We still love every ounce of it, but that’s the reality of the situation. But anyway, here are the new numbers for December 2012!